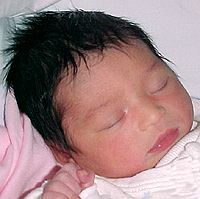 Nistha was born at 15:40 PST on July 26 in the Overlake Hospital, Bellevue, WA. She weighed 6lbs and was 18.5 inches long. She has dense dark hair, vivid eyes and she is said to be resembling to her mom !! Both Nistha and Mom (Renuka) are doing fine, with no complications from the delivery.